Generally Speaking, LED stands for Light-Emitting Diode. The first LED designed for illumination was the dual in-line package (DIP) LED, which is also called a “straw hat LED.” Its light efficiency was relatively low at that time – only about 4-5 lumen per unit or 0.05-0.08 watt per unit, which is about 60-80 lumen per wattage. The Surface Mounted Device (SMD) LED 3528 took the market by storm in 2008. One diode chip is encapsulated in a 2.8 mm x 3.5 mm rectangular shaped SMD. Later, the 5050SMD LED was developed. The SMD has three diode chips in a 5 x 5mm SMD. Since it has 3 chips, each also can be with a different color encapsulated(eg. Red, Green, Blue), it can be combined to create colorful lights. The RGB (Red, Green, Blue) SMD LED and the 5050RGB SMD LED are widely used in colorful flexible LED strips. COB (Chip On Board) LED technology was first seen on the market in 2010, at the Canton Fair in Guangzhou. The COB can be either aluminum or ceramic; we will discuss this later. First, let’s figure out: what is an SMD LED? 2. What is an SMD LED? SMD LED stands for Surface Mounted Device LED, which uses SMT technology to mount the LED chip on a PCB. The PCB is actually built in a rectangular-shaped, flat object, which is what we usually see as an SMD. If you peer into an SMD LED closely, you can see a tiny black point right in the center of the SMD; that is the LED chip. The chip is covered with phosphor powder and looks yellow or orange. The orange one usually emits warm white light (2700-3500K) and the yellow one may emit daylight white (6000-6500K). A colorful 5050 RGB (refer to picture 4) does not have phosphor powder in it. Above the phosphor power, a special type of optical silicon glue drips, eventually encapsulating the chip. Its rear side has 2 metal points (anode and cathode) that are used to solder with the circuit in a lighting fixture. The 5050 has 6 metal points since it has 3 chips within. Its rated power depends on the chip size; yes, it is the tiny black spot that is not always visible. Reviewing the above information will make it easier to explain the COB. But, please note: the 3030 and the 5630, which have high power, come after the COB. This is important, as it will help you to understand why the COB has the commercial value so as to grab market share at that moment; namely, we had only the 3528 and 5050 before the advent of the COB. 3. What is a COB LED? COB LED stands for Chips On Board LED, and is a LED lighting source with a type of new encapsulation technology. Compared to the 3528: 1 chip on board, or 5050: 3 chips, a COB LED light source will have multiple chips (dozens or even hundreds) on the same PCB (Printed Circuit Board). The COB has a PCB on its substrate; diode chips are arrayed in parallel or/and in series, depending on the circuit of the PCB. The substrate can be aluminum or ceramic. The ceramic type has a better thermal conductive performance that can guarantee a lower LED working temperature. Although the COB LED integrates many chips into one substrate, it only has 2 metal connection points: the anode and the cathode. Since the COB mounts the chips directly to the substrate, which have a large cooling area, the COB has better thermal conductivity compared to the SMD. So, when we design a circuit on the substrate, we may consider shortening the chip’s distance to get the COB size as little as possible. Why does the engineering tend to get a smaller size COB LED? In the SMD age, imagine you wanted to produce a 50 watt outdoor LED floodlight, while the 3528 only has a 0.06 watt. That means you will need about (50/0.06=833) 833 pieces 3528SMD on a floodlight altogether, and even each 3528SMD also needs space to ventilate and dissipate heat. Apparently, normal LED floodlights will not have enough space for 833 pieces of 3528SMD. The 50W COB LED dimension is only 36 x 36 mm. Only 36 x 36 mm will solve the problem, with 833 pieces of 3.5 x 2.8 mm – that’s darn fantastic. Remember: we talked about the SMD, which has 2 metal points on its rear side (refer to figure.2). The heat dissipation process of the SMD would be: the heat produced by diode chips mainly go through the 2 electrodes, then go to the substrate (commonly, the aluminum), then go to the heatsink. But for the COB, the process becomes simpler, because its chips are mounted directly to the substrate (aluminum or ceramic), the COB will have better thermal conductivity. Also, because of that, the chips’ distances are shortened and space is saved. Remember the floodlight story we talked about before? Manufacturing processes need to solder the electrode to the circuit. For the SMD, there would be 833 x 2 =1666 solder points; but for the COB, you only have 2 solder points to deal with – that will dramatically reduce the production failure rates. Furthermore, it saves labor time and you will pay less to workers. The shape of the COB is predesigned to meet a special structure of lighting fixture – the array of the chips cannot be changed once they are encapsulated. But the SMD is more flexible – the array of its chips is decided according to the PCB circuit layout and it can be changed to meet different engineering solutions. With the development of SMD LED technology, the high powered SMD, such as the 3030SMD, which has 0.9w rated power, came to the market now. So, to make a high-powered floodlight with SMD, such as 100w integrated solar street lights or 70W high mast lights, became possible. Both the SMD and the COB have wide applications, but the COB shape is relatively customized to meet various fixtures. you’d often encounter the problem of accurately sizing the battery. when the battery is undersized, the street light won’t be able to sustain for up to 3 rainy or cloudy days. Also, if the battery is oversized, you’d face the problem of sulfation, especially if it’s a flooded battery bank. Well, we have decided to completely solve the challenge of accurately sizing your battery. No need racking your head anymore on this task. By the time you’re done reading this, it’ll be such an easy task. We’ve compiled a detailed breakdown and a step by step guide to sizing the battery for your solar led street light. 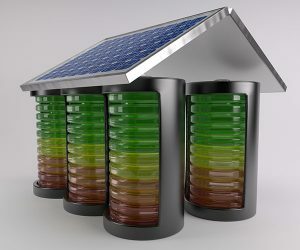 the Battery type used for off-grid solar streetlights are commonly deep cycle batteries. it’s very important that you clearly understand some related terms of solar batteries. This will help you understand the battery sizing process. The Power rating is the amount of energy that can be supplied by a battery at one time, it is measured in Watts. Let’s assume that a 12V battery supply 2Amps current to the solar system, we can say the battery can supply 24Watts. The battery capacity is the total amount of energy that can be stored by the battery, its unit is KWh, if the battery can supply 24W for 100 hours totally, we will say, its capacity is 2.4KWh. the Amp-hour is another expression of the battery capacity. we can see its capacity is 12 x 2 x 10 = 240Wh, or 20Ah. Depth of Discharge(DoD) refers to the available amount of energy that can be used in a battery when it is processed from a fully charged state to a fully discharged state. if the battery’s capacity is 100KWh, only 60KWh can be released to power the solar system, its DoD is 60%. Therefore, the DOD is a very important factor in the calculation of sizing the battery for solar street lights. as we known, a LiFePO4 battery type’s DOD is 80 percent, while GEL battery DOD is 50 percent. This refers to the ideal environmental temperature for a battery. The ideal temperature is 27°C (80°F) because a battery’s internal reaction is optimal at this temperature. If the temperature is lower, the battery’s efficiency will be reduced. higher temperature improves the efficiency only if it’s a little above 27°C and for a shorter time. Let’s go through an example to explain the battery sizing process step by step. Step 1: Prepare the data that is required. 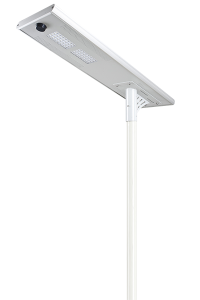 the rated power of the LED lamp in a solar streetlight is 30W at 12V. so the daily power consumption = 2.5 x 8 = 20Ah. that will be, 20Ah x 3 = 60Ah. Step 4: Considering the depth of discharge. The IESNA (Illuminating Engineering Society of North America) has defined various light distribution types. Light fixtures are designed to fall under one of the types defined, and lighting designers use this a guideline when selecting lighting for a particular area. Incorrectly selecting light fixtures can result in glare and light trespass into unwanted areas, such as onto the property of someone else. Type 1 distribution have a very narrow and long lighting area. This is useful when selecting a light fixture to light up a narrow area, such as a pathway or very narrow roadway. Type 1 fixtures would normally be placed along the center of the pathway. Type 2 distribution is used for wider pathways and narrow roadways (single lane),. Type 2 fixtures are usually placed off to the side of the pathway or roadway, since they are able to provide a small degree of forward light throw. Type 3 distribution is used primarily for roadway lighting, and is placed off to the side of the road. The forward throw on these fixtures allow light to product outwards, illuminating multi lane roadways. Type 4 distribution is used to light up parking lots as well as very wide roadways. Type 4 fixtures throw more light forward than they do to the sides, thus is not practical for lighting long roadways, as fixtures will need to be spaced closer together. Wall mounted fixtures such as wallpacks also commonly use type 4 distribution to throw light in front of an exterior entrance door to a building. Type 5 fixtures throw an equal amount of light in all directions around the fixture. This is usefull for lighting up parking lots, where the light fixtures are placed away from perimeter of the lot. Type V fixtures provide light in a circular pattern, where as Type VS provides light in a square pattern around the fixture. Both however have very similar distribution patterns. A solar power system(solar street lighting) is a reliable solution to harness and use energy obtained from the sun. And a solar battery is an indispensable part of this system, as it converts solar energy into battery chemical energy, which we can utilize in our daily life. Solar batteries are deep-cycle batteries, which are capable of surviving deep discharges, namely, Deep-cycle batteries allow to discharge large proportion of a battery’s capacity. Some of them can reach 90% DoD. Before the explanation of DoD, let’s first go through another relevant term, battery capacity. Battery Capacity is the total electrical energy that a battery can store, which is measured in kWH. If the battery can sustain 500 watt loads of power consumption in your house for a total of 60 hours, then its capacity would be 0.5×60=30kWH. During that period, the battery goes from being fully charged, to a state of being completely discharged. what is DoD and how does it affect a battery’s lifespan? DoD stands for Depth of Discharge, which measures how deeply discharged a battery is, assuming the battery has a nominal capacity of 100 kWh, which discharges 30kW in 1 hour. Its DOD would be (30x 1)/100 = 30%. Since over discharge can dramatically damage a rechargeable battery, a concrete request on maximum DoD is defined by manufacturers. This data is very useful for you when you are designing an off-grid solar power system – you can set up the LVD (Low Voltage Disconnect) function on the solar charge controller to disconnect the battery from loads before reaching the limited DoD, established by the manufacturer. Flooded lead-acid usually has 50% DoD, while lithium-ion can reach up to 80% DoD. LiFePO4 performs better than any other lithium-ion battery and can reach up to 90%, and our advanced integrated solar street lights have adopted the LiFePO4 battery. Some other manufacturers may describe the data as SOC. SOC is the acronym for the State of Discharge. Just like the depth of discharge, SOC is a term of measurement in batteries. In fact, SOC is the direct opposite of DOD – while DOD is at 100%, SOC is at 0%; when DoD is at 40%, SoC is at 60%. Why is DoD important to battery? We can equate battery cycle life with battery lifespan. Manufacturers commonly declare the cycle life at a certain value of DoD; for example, LiNCM declares the cycle life to be 1900 @ 80% DoD. The larger the DoD every cycle, the smaller the available cycle times will be. We can see that DoD affects the life expectancy of a battery directly, and this theory applies to most rechargeable batteries: lithium-ion, lead-acid or nickel-iron. From this graph, we can see a dramatic disparity: the battery’s cycle life is up to 7000 times at 10% DoD, while only 500 times at 100% DoD. Besides Depth of Discharge, the working temperature also has a great impact on battery performance. The charge and discharge of a battery depend on chemical reactions inside, while the chemical reaction of the battery has a great relationship with the temperature. Its nominal capacity is measured at warm 27°C (80°F) since its chemical reaction performance is most efficient at that temperature. Low temperatures can reduce the activity of electrolytes in a battery. A battery that provides 100% capacity at 27°C will typically deliver only 40% at –20°C. Although warmer or higher temperature improves performance slightly, prolonged exposure will evaporate electrolytes and result in the permanent capacity loss. When sizing the battery for an off-grid solar system, we need to consider that DoD and working temperature are the most important factors. Use a solar charge controller with LVD (low voltage disconnect) function to ensure that the discharging battery does not exceed the limited DoD, which is advised by the manufacturer, so as to guarantee battery lifespan. 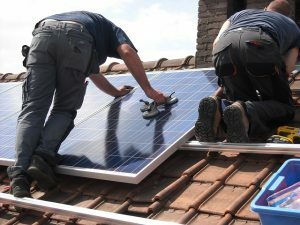 With the development of photovoltaic technology, the conversion efficiency of solar panels has improved significantly: from 5% in 1945 (the solar panel’s inception) to 20% in 2015. Solar panels also stirred a big commercial change all over the world, especially in the Middle East, where Dubai Awards $3.9 Billion Solar Energy Contract couple of months ago. Indeed, more and more municipal projects choose to use solar street lights to replace traditional streetlights. 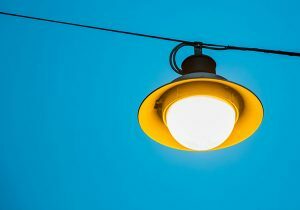 But what are the benefits of replacing traditional halogen streetlights with solar streetlights? And what are the differences between them? Let’s dive into the useful information! Typically, there are two types of solar streetlights: off-grid and grid-tied. 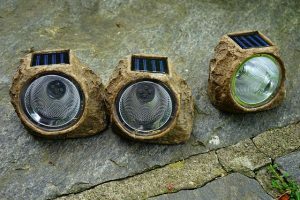 Off-grid solar streetlights are disconnected from the electric utility company and stand alone like a small solar lighting system unit. They convert solar energy into battery storage during the day, then illuminate the road at night. Commonly, they are designed to sustain 3 cloudy days, when there is little solar power to convert. So, if your location has seasonal rainy days that last more than 3 days, you may consider going with grid-tied solar panel streetlights. Vice versa, grid-tied solar panel streetlights are connected to an electric utility company, and will only use electricity as a backup in case there is a period of prolonged cloudy weather. 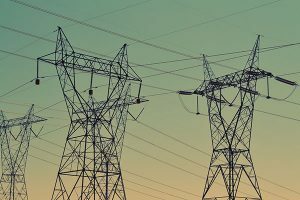 in order to get optimal results, both off-grid and grid-tied types should consider several engineering parameters: local weather conditions, panel size, light source watts, battery bank size, days of autonomy, lux level on the ground, beam angle and light posts distance. Traditional halogen streetlights consider little about these parameters. Nowadays, with the development of LED lighting technology, all types of streetlights are switching their light sources to LED, because LED provides great lighting efficiency: >150lumen per watt and a long lifespan (>35000 hours), which means there is no maintenance cost for over 7 years. Meanwhile, rather than traditional halogen bulb lights, which emit diffused light and require a reflector cup on its upper side to reflect light downwards, LED lights emit directional lights, so a reflector cup may not be essential. 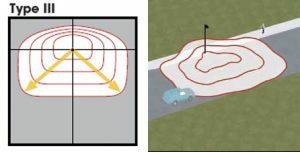 for instance, the Type III distribution is meant for roadway lighting, general parking areas and other areas where a larger area of lighting is required. Additionally, LED lights provide the same brightness as bulb lights, while using less battery energy (commonly, LED lights only need 1/5 to 1/2 watts compared to halogen lights). This is important information for solar street lights. When designed, a solar street system requires a smaller solar panel and a smaller solar battery than before in halogen age. This means that people can integrate solar panel, light source, battery and charge controller into one structure when designing a compact structure for solar street lights. Finally, new compact solar streetlights, also called all-in-one solar streetlights, have become popular in recent years. But what do we get in comparison? If your projects relate to grid-tied types, switching to LED is the most viable solution to reduce your power consumption. Furthermore, grid-tied projects can use solar panels to harness solar energy to reduce, even more, the electricity bill every month. 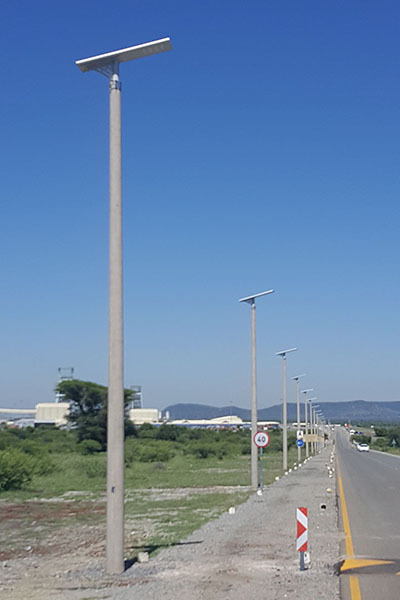 If your projects are new, or are in a rural area where it is impossible to bring in municipal electricity, then off-grid solar streetlights are the best option. Suffice it to say, solar panel streetlights, which harness green and free energy from the sun, have less or no impact on the environment, while traditional streetlights use the electricity, which is produced from non-renewable energy. 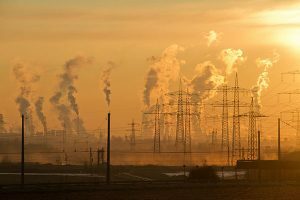 Moreover, the use of non-renewable energy also results in the production of greenhouse gas – carbon dioxide. The initial investment of solar streetlights is higher than conventional halogen streetlights because of the higher cost of solar panels and batteries. But since it harnesses free solar energy, future savings will offset the upfront investment. In the long term, solar streetlights are more cost-effective, for sure. The kind of streetlights one should select is based on the concrete requirements of projects and one’s budgets. Switching to LED fixtures will lower the power consumption and system loads. We should also expect the technology of the graphene battery, which could be the revolutionary energy storage technology in the future. Also, we think the graphene battery technology will benefit solar lighting dramatically as LED technology since a powerful battery will ensure longer days of autonomy at the same battery size level. 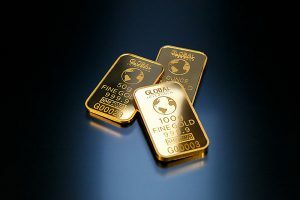 Let’s expect the new battery technology.